Yesterday I was cleaning the shelves and the kitchen cart below. 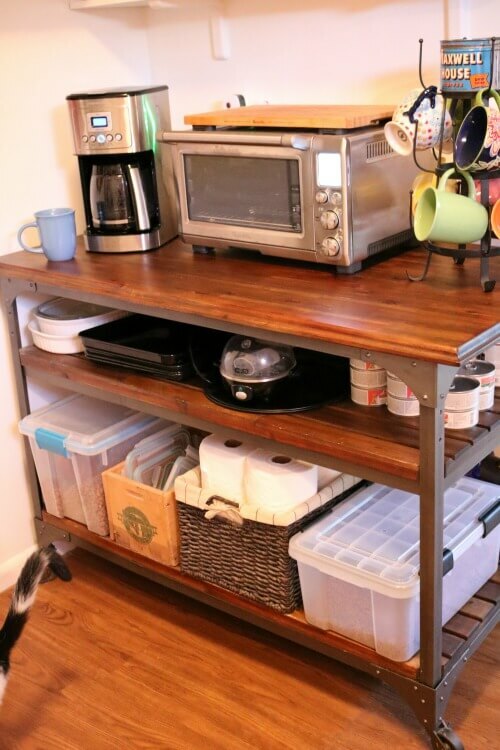 As I cleaned, I was reminded of all the alternative ways I’ve found to use every inch of space in organizing a small kitchen. Just outside my kitchen in the dining room I have the blue hutch with my everyday dishes. Since it’s right across from my dining table, it is very handy. It’s just outside of my kitchen, but the dishes I use everyday are in a more convenient spot . 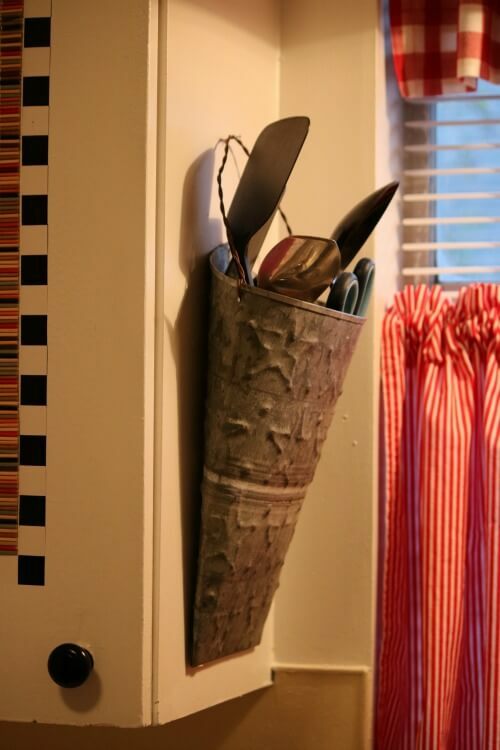 You want to store things where you can readily find them and where they’re handy to get to. I store all the pet meds and such in a big basket that sits on top of my washer. This way I know where things are and can get to them easily. When I’m using the washer, I use this basket with the pet meds on the adjacent counter to hold the hose in place that squeezes water out into the sink. It holds it there nicely so the hose doesn’t flop around and end up making a mess on the floor. 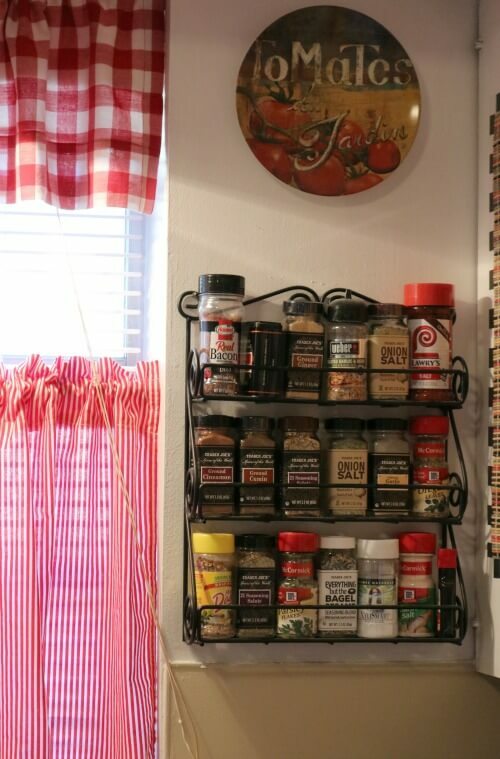 My spices are all organized on this wall spice rack. I found it on eBay. I think it was about $15. It puts the spices where I can readily find what I want and even better it’s off the limited counter space. From where I’m standing by the sink, I’m looking down on the kitchen cart I cleaned yesterday. I use every spare inch of that thing. I found it at World Market years ago and ordered it. On the top shelf are things I use for cooking in my Breville. Glass bakeware with lids and flatter pans that came with it are left to right. Then there’s the little appliance that I use to cook eggs for Charlie, with the pizza pans (also came with the Breville) underneath it. At the right end of the top shelf is canned dog and cat food all lined up and ready for when I feed them. 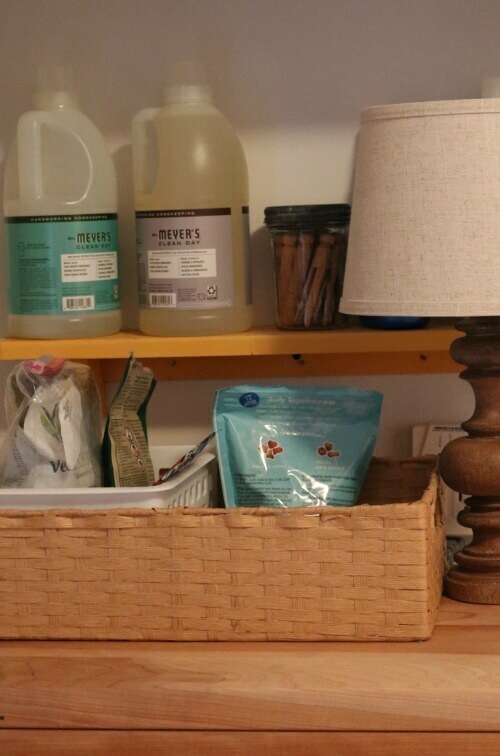 On the bottom shelf, left to right, is a container of Charlie’s dry dog food. I use the old vintage box to store the lids for glass storage I found on Amazon a few years ago. I just love this set because it’s just right for one person. You can check it out here. Then there’s the basket of paper towels. After that is the container of Ivy’s dry cat food. Now let me show you where I store the glass storage that match the lids I just mentioned. I use the bottom bins in my fridge that I really never used for anything else (because I’d forget about it and it would spoil) for the aforementioned glass storage set. 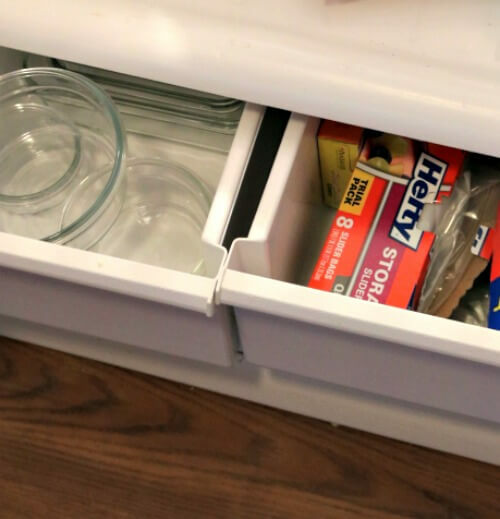 Why not use the refrigerator for storing more than food? There’s no law saying you can’t. Next to my refrigerator is the dishwasher. I store cookie sheets, muffin pans and cookware in there. As you know I don’t use the cabinets and drawers in my kitchen. After I had mice problem a few years ago, I decided I’d rather have things out where I can see them. It’s easier for me to locate and I don’t have to worry about mice, though they’ve been gone for some time. Besides that, the drawers are in awful shape. They are not on sliders therefore they never stay lined in place. They’re ridiculous to try to open and close. I finally had Nathan nail them shut to keep them looking halfway right. My silverware are in the ceramic containers (man and woman) above. Next to that is my knife set and on the other side are the cutting boards I use most often. Here are where the rest of them are. I am using every bit of vertical wall space for storage than I can in this apartment kitchen. Here is where I now store the kitchen utensils. I had them in a pretty red container, but I accidentally knocked it off the counter and broke it. So when I was looking around for what I wanted to put utensils in, I thought: why not put that on the wall too? So I did. I’ve had this hanging galvanized container I’ve for years. So I used it. You need to go through your kitchen utensils occasionally to weed out what you don’t use. I did that and found I didn’t use most of the utensils I was storing. Now what I do use are a few spoons and such, scissors, a manual can opener and an ice cream scoop. Since I traded out my stove for my washing machine when I moved in, I use an electric skillet for much of my cooking. Everything else I cook in either the Breville or the microwave. As you can see I store the electric skillet on top of the refrigerator. My oven mitts are adjacent to the Breville. They’re very handy to have hanging here when I need them. I don’t need to move an inch to grab one when taking something out of the Breville. These little red and white polka dotted bowls are actually measuring bowls. I keep them on the wall shelves. All of my glasses are in this vintage box. I gave the rest to my daughter. I don’t need five different sets of glasses for one person. Now I have four taller glasses and four small ones. I got a good buy on this large Dawn dish washing detergent. But it hurts my hand to lift it, so I just store it here along with hand soap. 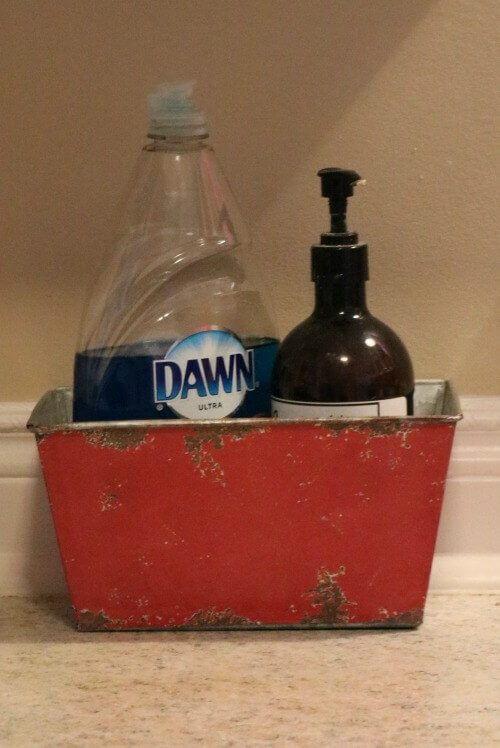 A smaller bottle of Dawn is on the other side of the sink. I can’t seem to find a cork to go in the top of it. And I’m on a no buying freeze. By putting these items together in a box, it doesn’t looked as cluttered. I’ve learned that having individual items on your counters looks better when corralled in some sort of container. And there’s the baking soda I now use (thanks for the tip) to clean pans, etc. As I type this I have an empty plastic Parmesan cheese container soaking in the sink. I’m soaking the label off before I put the baking soda in it. I will never use commercial solutions for this type of cleaning again. I don’t like the chemicals. And really, baking soda cleans tough bits of cooking and food off better than anything I’ve used before. Also baking soda is cheaper. Much cheaper! I’m so glad we’re trading tips, because they’re really helping me. And I hope they help you too. Brenda, good morning! So many great tips! I love all of the frugal tips, homemade house cleaners, etc. I cannot wait to try the baking soda to clean my pans. I never knew that putting a little water and baking soda together to make a paste would clean things so well! 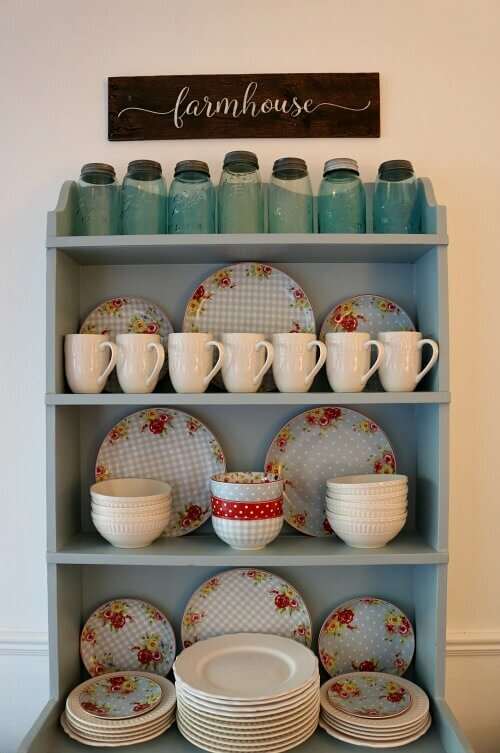 You always come up with clever and attractive storage ideas! I organize the inside of my fridge using cafeteria trays that I found on Amazon. Dairy on one tray, etc. Easy to find what I want and keeps the fridge shelves cleaner. 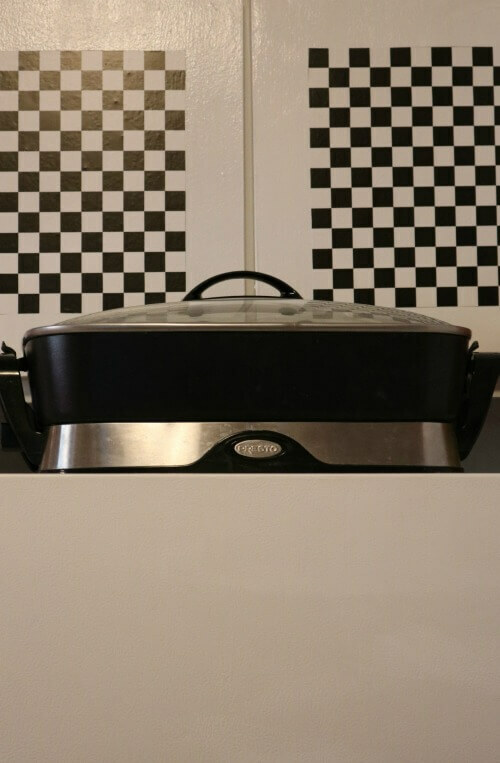 I know you probably have all the appliances you need but have wondered if an electric hot plate would be useful to you? Those electric skillets are great tho; you can cook anything in them! I know what you mean by getting rid of unneeded utensils…I did that recently and got rid of 2 shoeboxes full. Amazing how much stuff accumulates over time. I love the idea of cafeteria trays! I’m going to check into that when I’m not on a spending freeze. The weather is so bad here in southern Ontario Brenda that I am saving quite a bit of money by not going out! This happened last month too and I was surprised at how low my credit card bill was. By the way I nearly always read your blog even if I don’t write a reply. It is always so interesting, thank you! Funny how bad weather helps you save money! You are so creative and organized! Everything is so cozy and appealing. I was surprised to learn that you don’t have a stove. I can’t imagine being without my stove. But the appliances you have do the job and meet your needs. The washer is conveniently placed. I am wondering about the washer’s mate. Do you have a dryer? If so, where is she? It both washes and dries. I can’t say it dries as well as a regular dryer, but suits my needs. I don’t miss not having a stove. I know you don’t use your cupboards because you had a mice problem…. but I wondered if you have ever thought about just removing the doors? Then you will have several units with shelves – and perhaps this may help you with the “don’t quite know where to put it” problem….. especially now thatIvy is bouncing around! I had the doors off once. But then I had to store them, and they take up a lot of space. I don’t know about wisdom. But I’ve learned to be creative with small spaces. Hello on Sunday Brenda. Wow ,,,, wonderful household tips! I love your blue gingham dishes. Floral borders are lovely. Also, your all-white mugs are a favorite ❤ of mine. Drinking a hot beverage in all white cups or mugs tastes better!! Silly huh? After reading 😃 your suggestions, I want to clean out this kitchen!! P. S. In one photo, I see 🐱Ivy Lou’s cute tail! Your Charlie is 💘 adorable! Yes, I couldn’t coax her out of the way. BE CAREFUL USING SOLID TRAYS IN FRIG FOR THEY CAN LIMIT THE FLOW OF AIR INSIDE, THAT AFFECTS THE TEMP OF THE FOOD STORED THERE. THE SHELVES ARE OPEN FOR A SPECIFIC REASON. Ah! Thanks for telling us! I guess if the shelves are solid glass it doesn’t matter though. If the shelves are solid glass like mine, they probably have airway space around the sides and back for airflow. I do know you are not supposed to restrict the airflow. Since my fridge is getting old, I keep a thermometer on the inside wall to be certain it’s maintaining the proper temp. 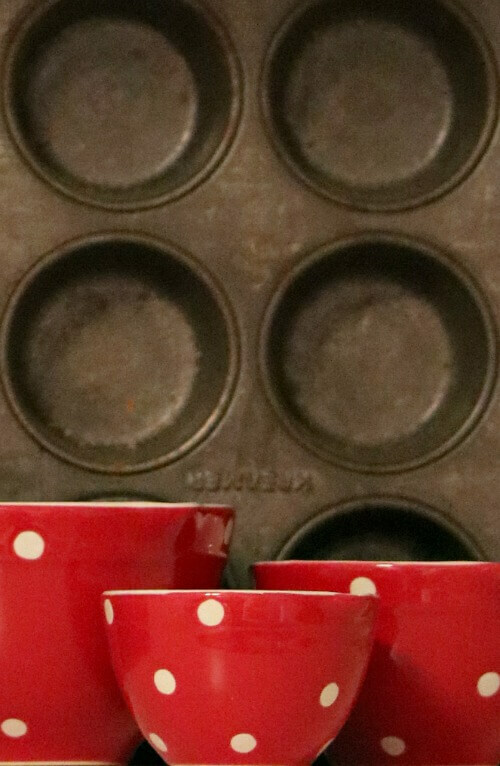 Love the red and white polka dot measuring bowls. So festive! I love them too. I have the smallest one in the sugar canister to scoop sugar. Hello. Happy Sunday! I decided to buy some small baskets at the dollar store to store packets of mixes and small things in. They seem to get lost in my pantry. The other day I emptied a container of sliced mushrooms and thought this is the perfect size. It got me to thinking about using what I have. Thanks for so many ideas! I don’t really have a “pantry.” I make do with the little cupboard and my wall shelves. But I can find things easier if, like you, I put them in small baskets, etc. You have such a cute kitchen and your decorating skills are great. I think whoever is managing your apartment building has taken advantage of your nature. At a minimum, I believe they should have tracked down how the mice got into your cabinets and plugged up any crevices, cracks or holes that the mice might have been using to enter your apartment and/or cabinets and then gave everything a thorough disinfecting so you would not have to do it; or replaced the existing cabinets with new sturdy ones. That’s the least they could do, I think, geez! Why should you be paying rent for partially unusable space? I think it’s a shame on your landlord that you’re paying rent for an apartment that has a kitchen rendered unusable to you, you should have one that’s usable and provides you with storage other than the inside of your dishwasher and refrigerator drawers! Tell that to the owner. At least he’s been doing more in the past year since his own people took over. We got the insulation. I’ve lived here 5 years in April. They simply do not do updates. And I can’t afford to pay more than I’m paying, which is around $650+water. I always keep a parmesan cheese container filled with baking soda by my sink. It is the handiest thing in the kitchen for cleaning and so easy to shake a little out from that container. Also remember if you have a small kitchen fire (hope not!) you can shake a little baking soda on it to put it out. I love seeing how you organize things! I need to get busy on my kitchen. Maybe it was you who gave me the idea. One of you gave me the tip about the Parmesan cheese container for baking soda. If I had a fire, it would probably be electric. I don’t have a stove. So that won’t catch fire! 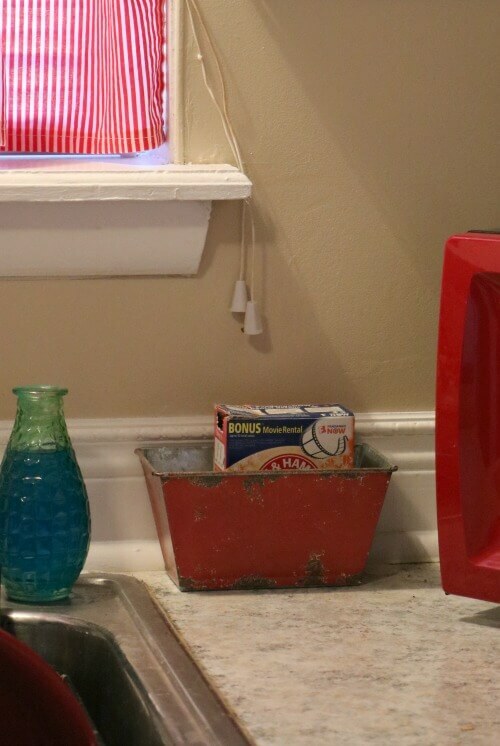 Keeping baking soda near the stove is a very good idea. My daughter got a burner fire started(greasy water had boiled over on it) and she was yelling fire! The baking soda wasn’t right there, but the salt box was in the drawer right next to it, and that works well, too. Also a big lid plopped over a small burner fire will smother it out. Also, I was thinking about your unusable cabinets. Do you not use them because of the mice and food? I’m sure that is why. 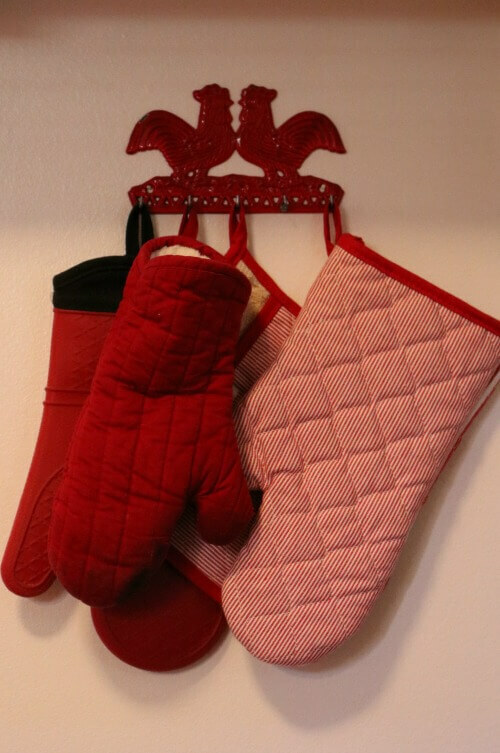 Could you use them for some of your decorations that are in your closet? Things that would not be contaminated if that is your fear? It seems like such a waste to have them sitting empty when you are so squeezed for space. Just a thought. It’s the funniest thing to me that at least two other readers say they use an empty Parmesan cheese container for baking soda to use in the kitchen! I have done the exact same thing for years and years. I have one in the kitchen and one in the bathroom. As they say, “Great minds think alike” or something like that. There are definitely a lot of great minds reading this blog! Brenda, you really are a master at storage in a small kitchen. You evidently don’t mind not having use of your cupboards, but I wonder if the management even knows that they have been mice infested and if they did, maybe they would be willing to examine the areas around the lower cabinets and use some of the spray stuff that’s available to plug up the holes where the mice have come in. I just had a new dishwasher installed and with the old one out discovered that there were gaps where the floor meets the drywall. We plugged them with a spray foam-type product and since then I have had no mouse problems under the sink nor in the drawers on that wall of cabinets. I hadn’t known about the spray stuff but my daughter did. Anyway, just an FYI. And if you are happy with the other storage you’ve worked out that’s fine, too. Speaking of finding a lot of kitchen utensils you rarely or never use, I cleaned out a kitchen drawer the other day and found a whole lot of items I barely ever use. I will recycle them and that drawer won’t be so over-full and jumbled every time I open it to get something. Yay! And then there’s the fridg. It’s plenty big for me but since my daughter and her two boys moved in it has shrunk! Keeping track of things put in it is a constant struggle. I try to keep similar things in the same areas, but not everyone else does the same! I hate to give in and admit that we need a bigger fridg, but I fear it is coming to that. Thanks for all the storage ideas. I love hearing everyone else’s ideas and solutions. What shall we work on next? I would really like to know the name of the spray stuff to plug those cracks and holes. I think it would solve some issues for me. It is expanding foam. The home stores, Walmart and many others all have it. It sprays in and expands to fill spaces. It’s not an expensive fix, either. You always provide a plethora of storage and decorating ideas. Thank you so much! I love your cozy little house. 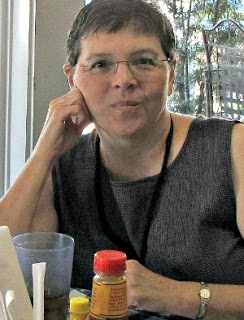 I really enjoy reading your blog! Thanks Brenda! I got a few good ideas I can use. Trouble is.. when you have a hubby who keeps BUYING kitchen stuff at the thrift store, it all gets jumbled and overcrowded very quickly! He buys it.. I try to stuff it in somewhere, and then at the next garage sale, I sell it. But I swear, I don’t want any more garage sales. I hate having them! I could pare down very nicely as I don’t need that much. I use ONE cutting board, which is small. He has bought several other ones and they just take up space and I never use them! I did go to storing my silverware on the counter in glasses, but I like your idea of the cute little holders, so will seek some out. That freed up an entire drawer and it’s so much easier to reach for a spoon or fork right there where you are cooking. 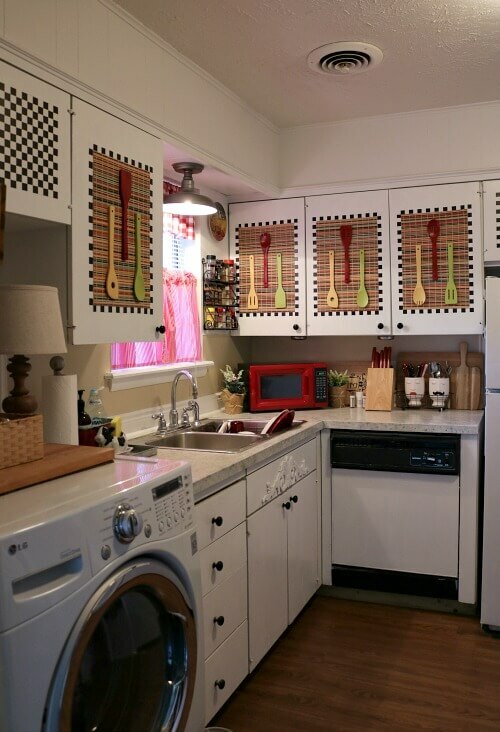 I also like the idea of the larger utensils on the wall by the stove. 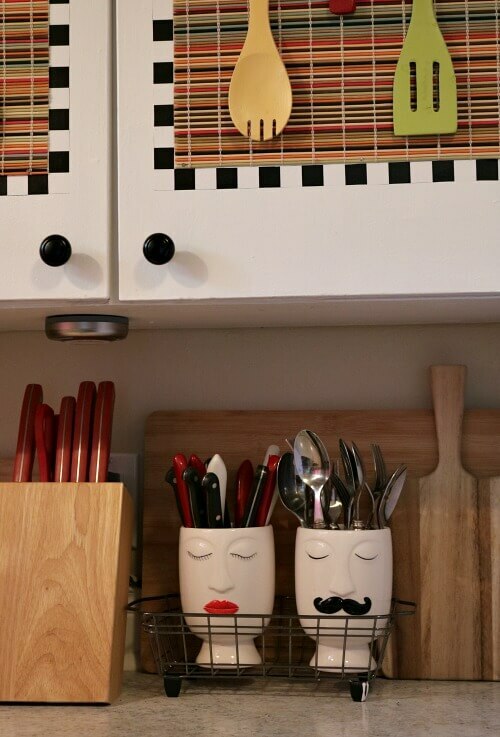 I put my lids in a rack on the wall right above the stove which I love. Was always digging in the drawer underneath the stove for lids. I have mugs hanging on hooks as well as potholders. I think almost all of my wall space is used up! And I do have room on the top of my fridge for my toaster oven, which I love, but it is currently stored in the garage and never used. I’m going out to get it very shortly! Love your tips – your kitchen is wonderfully efficient and charmingly decorated. I see you like Mrs. Meyers Cleaning products too – I love the basil – and it comes in so many scents, but my grocery stores in this area only carry the basics – like basil, lavender, and geranium, which I don’t like. So many great ideas, Brenda! Functional and beautiful! I am always on the hunt for storage solutions! 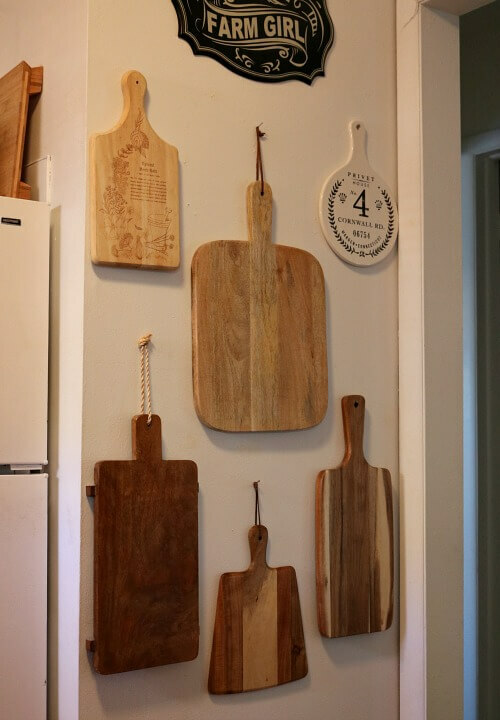 I still love those cutting boards on the wall! They look amazing and since they’re flat they don’t take up any extra space. Fabulous! 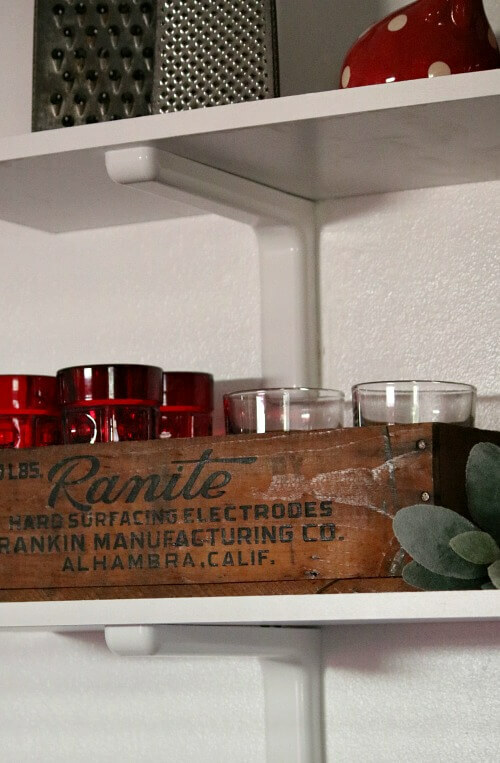 Brenda, I love your kitchen decor and storage ideas! I really like the idea of using the walls to store the items you use the most. I have some empty space and may try hanging my cutting boards also. I love that look! Love and hugs! Just now getting to read your post. I’m running behind! You have done a fantastic job organizing. Everything looks so nice. Your home looks so cozy and comfy!